DA Form 7281 - also known as the "Command Oriented Arms, Ammunation, And Explosives (aa&e) Security Screening And Evaluation Record (fillable)" - is a Military form issued and used by the United States Department of the Army. The form - often mistakenly referred to as the DD form 7281 - was last revised on September 1, 2009. Download an up-to-date fillable PDF version of the DA 7281 below or request a copy through the chain of command. 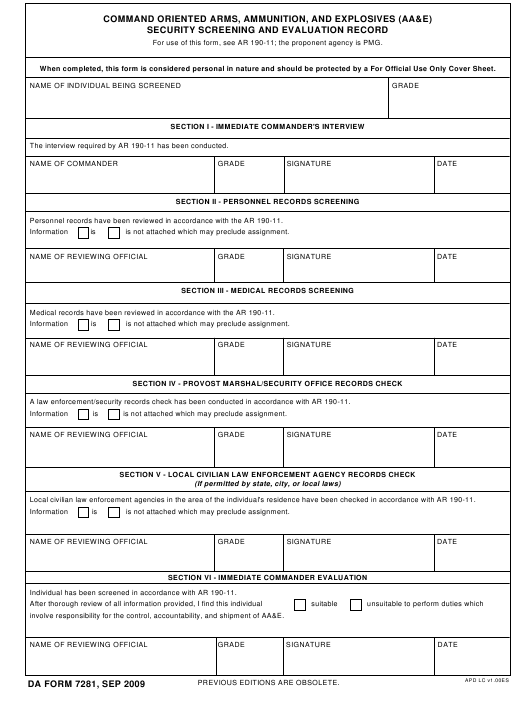 When completed, this form is considered personal in nature and should be protected by a For Official Use Only Cover Sheet. The interview required by AR 190-11 has been conducted. Personnel records have been reviewed in accordance with the AR 190-11. Medical records have been reviewed in accordance with the AR 190-11. A law enforcement/security records check has been conducted in accordance with AR 190-11. Local civilian law enforcement agencies in the area of the individual's residence have been checked in accordance with AR 190-11. Individual has been screened in accordance with AR 190-11.
involve responsibility for the control, accountability, and shipment of AA&E.